Non Water Soluble Refractory Mortar. 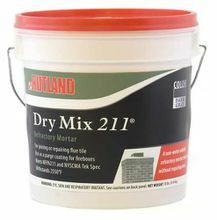 A dry blend which when mixed as directed with water produces a medium-duty, non-water soluble, calcium aluminate refractory mortar which meets or exceeds all the requirements of the National Fire Protection Association standard NFPA211, 1988 edition. Besides joining flue tiles, this mortar may be used in building fireboxes, as a light coating and also has applications in other chimney lining systems. Acid resistant, 2500 psi compressive strength.